Your chakras are the energy centers of your body that hold your spiritual power. There are seven main chakras that begin at the base of your spine (root chakra) and rise up through the crown of your head (crown chakra), and each is associated with a color from red at the root chakra and up through purple at the crown chakra. The colors directly correspond to the functionality of the nerves within that chakra. For instance, when you wear blue or carry a blue healing crystal, you are actually igniting your throat chakra. 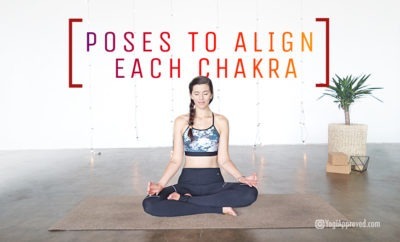 Your chakras can become unbalanced due to a variety of factors in your daily life, but thankfully there are many practices and products that can help you realign your chakras, center your body, and bring balance to your life overall. As a yogi, your yoga mat and yoga mat bag probably goes with you almost everywhere you go, so why not sport a fun and unique bag that looks great and keeps you mindful? The Chakra Yoga Mat Bag from Yogamasti will become your new favorite yoga mat bag because it is oversized and can fit up to two yoga mats and your clothing too! The bag has an inner zipper pocket that is perfect to safely store your valuables while you are traveling or in class, and the convenient cell phone pocket on the 3-inch thick carrying strap will keep your phone within reach, but secure. The best feature is the cute embroidered chakra design in the corresponding chakra colors that goes down the front of the bag. The dark black color of the cotton bag will keep it clean and beautiful for years to come. Show off your love of chakras and healing crystals with the Abundant Leggings from Confused Girl in the City. 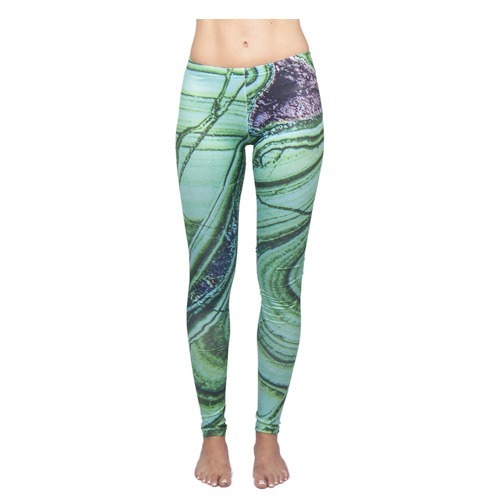 The pale green leggings are designed from images taken of a real malachite stone, a stone of the heart chakra that promotes good fortune and abundance. 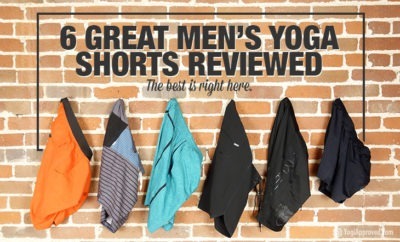 The polyester/lycra-blend material is extra soft and comfortable, and the fold-over waist is cute and functional. Despite the thin material, the leggings aren’t sheer, even in forward folds. The leggings are long – so tall yogis rejoice – but they look cute bunched at the ankles or folded over the heel for our petite friends. The leggings are printed with water-based ink and feature 4-way stretch, moisture wicking, and breathable fabric. The company offers a variety of other healing crystal-inspired leggings, so you are sure to find your favorite stone in the mix. The leggings are available in XS-XXL in a variety of healing crystal designs. Healing crystal jewelry is a great way to align and balance your chakras and look fab doing it! The Sandalwood Chakra Bracelets from LovePray Jewelry is a collection of seven bracelets that each align with a specific chakra. Each bracelet is handmade from sandalwood – which helps prevent distractions and helps you open the highest spiritual centers to align your chakras – and features four faceted stones that represent and stimulate that chakra. The bright red jasper is on the root chakra bracelet and the beautiful purple amethyst is on the crown chakra bracelet, with stones to represent every color of the rainbow in between. Best of all, the colors are subtle and non-flashy, so they are great for both men and women to wear to help align their chakras. Following the immense popularity of their colorful Chakra Leggings, Om Shanti Clothing just released a new Black Chakra Performance Legging that match style and performance. The bold asymmetrical mandala design with a simple black and white print is not what you would typically imagine when you think of chakras, but the comfort and sheer beauty of these leggings will be sure to lift your spirits and keep you feeling centered day after day. 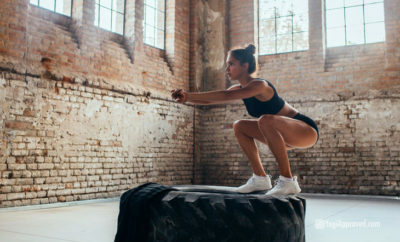 The leggings are made of recycled yarn from plastic bottles as well as spandex, and use an eco-friendly process that conserves water and energy during the manufacturing process. These breathtaking leggings are moisture-wicking and anti-microbial, so you will stay fresh and dry from savasana to the supermarket. The leggings are available in XXS-L. Essential oils are known to have healing properties and also help cleanse and balance your chakras. 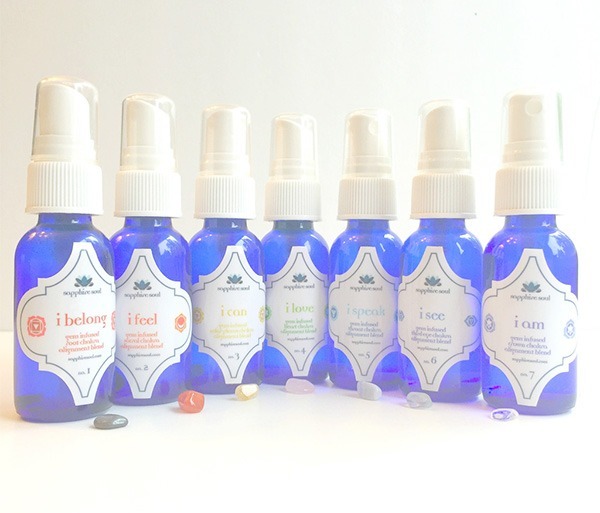 Sapphire Soul brings you a Set of 7 Gem Infused Chakra Essential Oil Blends Mists and Roll-on Oils, which are made of therapeutic-grade essential oils infused with healing crystals that correspond to each chakra. Each bottle is labeled with an inspiring “I” mantra that relates to the corresponding chakra, such as “I love” for your heart chakra, or “I see” for your third eye chakra. Toss this mist bottle or roll-on into your purse or yoga bag for quick and easy use on the go. 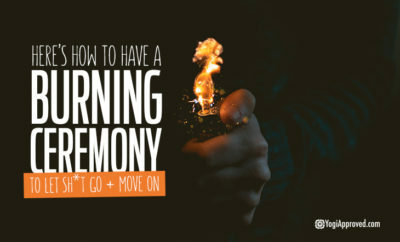 You can use the mist as room spray before yoga or meditation, and you can use the mist or roll-on for a quick refresher or pick-me-up throughout your day. 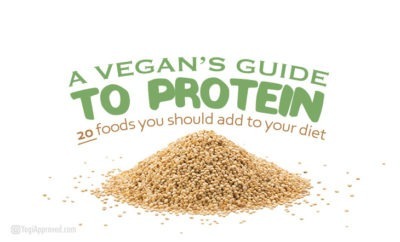 Save 40% off through December 18 by entering the code YABLENDS at checkout. The clothing that you choose to wear is an extension of your personality, but it can also have purpose. The Printed Hot Set from the Italian company Mia Luna is a cute and stylish bra top and shorts set that is great for your yoga practice, and so comfy you’ll want to wear the set for lounging too. The luxurious and buttery-soft pair is made of bamboo, organic cotton and elastin in a beautiful turquoise color with the agnya design (inspired by the lotus characteristics of the third eye) repeating throughout the fabric. The print is hand-painted with a corrosion technique, eliminating the risk of the print fading or flaking – this set is built to last! The bra top has a flirty low back and the shorts have adjustable drawstrings on the sides, so you show as much or little skin as you desire. The set comes in a reusable mesh laundry and transport bag with a piece of selenite tied to a string, and it’s those little attention to details that make interactions with this brand unique and personal. The set is available in sizes XS-L, and the line runs large, so size down for a comfortable fit. 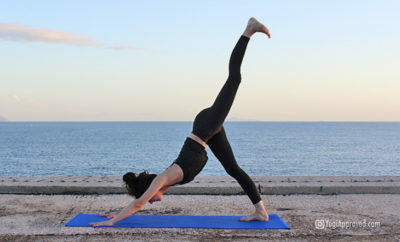 What better way to put your chakras at the forefront of your mind than seeing them on your yoga mat? 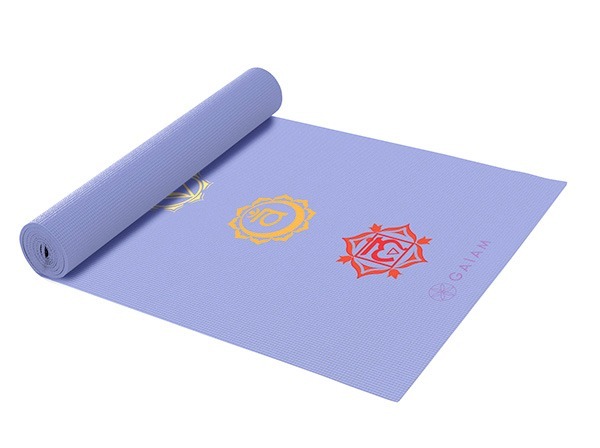 The Chakra Print Yoga Mat by Gaiam is an inexpensive, non-slip 3mm-thick yoga mat that is lightweight and great to keep in your car for yoga on-the-go. 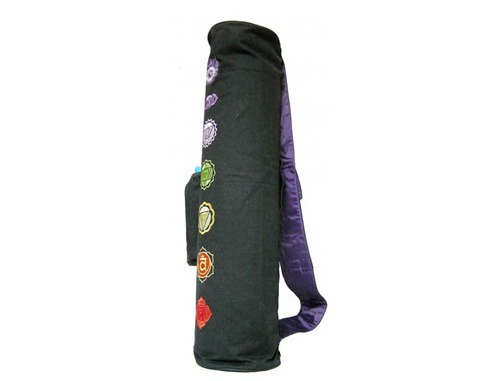 This durable yoga mat has a beautiful bluish-purple color and features colorful representations of the seven chakras down the center of the mat. The Gaiam Chakra mat is made of PVC without latex and harmful phthalates, and due to the construction, there may be an odor that will dissipate after airing out for a few days. 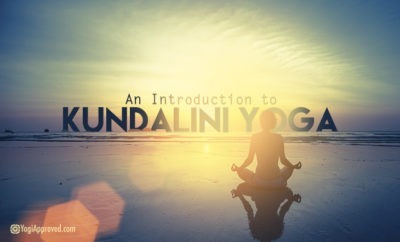 Grab yourself this inexpensive portable yoga mat and be even more mindful in your yoga practice. The Chakra Collection by Raga Varnish is a nail polish collection that is inspired by the seven chakras. The polish goes on smoothly and dries quickly, and you only need a single coat to create a full, solid and non-transparent coat of color. Wear this polish on your fingers and toes to serve as a constant reminder to act from a place of love (Anahata for the heart chakra) and to communicate clearly (Vishuddha for the throat chakra). 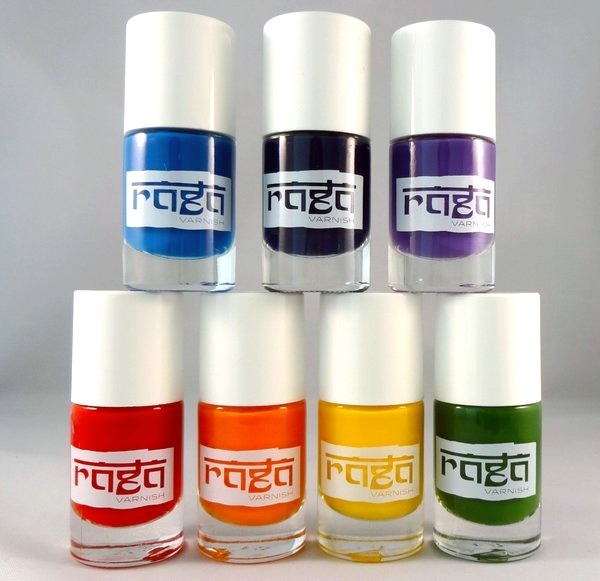 Or, you can choose from Raga Varnish’s variety of other chakra-inspired colors to pinpoint any of your chakras that are in need of a little TLC. 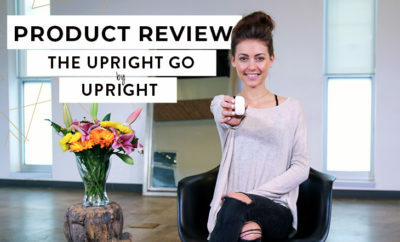 In addition to your yoga and meditation practice, you can utilize these products to help balance your chakras and increase your physical and mental wellbeing. 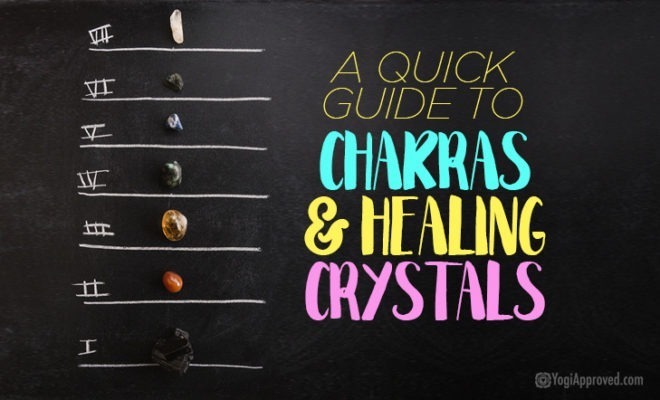 If you are ever feeling out of sorts or unbalanced in any way, consider which part of your body is not feeling right and consider chakra therapy or corresponding healing crystals as a remedy. If you are feeling mentally blocked, wear or carry purple items that correspond to your crown chakra. If you are heartbroken or feeling emotionally conflicted, wear pink or green for your heart chakra. 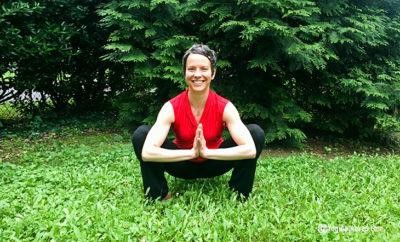 If you are feeling airy, unsettled or insecure, wear red for your root chakra. 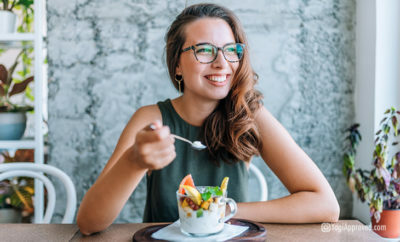 Whether you just appreciate the color and design of chakra-inspired products or you turn to them for your health and wellbeing, chakra products are beautiful and are said to have many positive healing properties, so wear your energy on your sleeve and create a powerful shift in your physical, mental, emotional, and spiritual energy.